Migrating and copying data and modifications from your testing website to the live one is very easy with WP Staging Pro and does not cost you more than a few clicks. The tutorial below explains how to migrate your site by using WP Staging Pro version. If you like to convert your staging site to the production site with WP Staging basic version instead please read that article! This video below shows how WP Staging Pro pushes data from the staging site to the live one. You can either repeat the operation you did on the staging site manually on the live site or just use WP Staging Pro’s database migration feature which is included behind the Push Changes feature. The staging site which you previously created with WP Staging or WP Staging Pro. At first, backup the entire live and staging site. Note: At the file selection dialog of BackWPup make sure to select and include the WP Staging subfolder of the staging site. This is important to make a backup copy of your staging site as well. 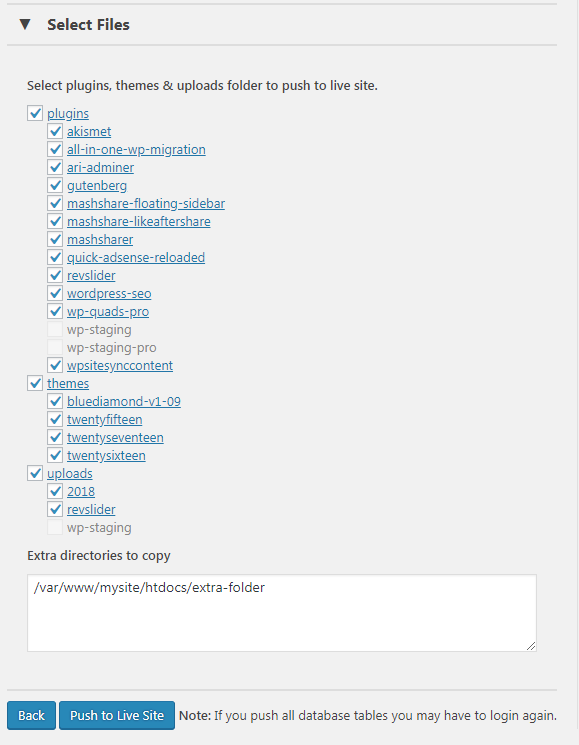 On the Live Site, use WP Staging Pro to copy all new plugins, media and theme files from staging site to the live site. 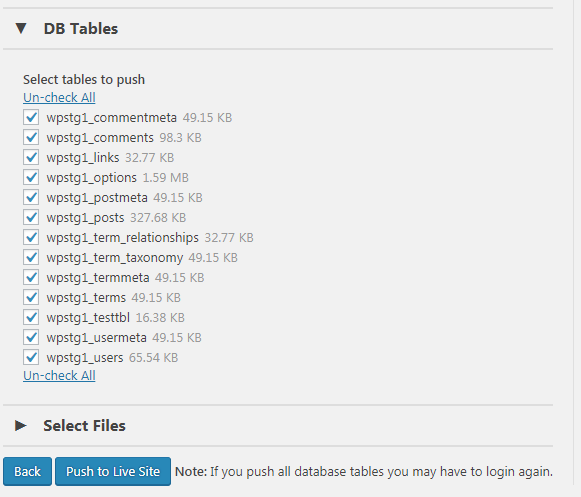 Click on DB Tables and select all the database tables you want to copy over to the production site. Note that any selected table will overwrite its pendant on the production site completely. If you want to exclude certain data from being overwritten on the live site you need to exclude the relevant database table. Check out the link below to learn more about WordPress core tables and to find out which data is available in a certain table. If you have a shop system like wooCommerce you obviously do not want to overwrite orders and customer data on the live site. Note: If you like to use WP Staging only for testing plugins and theme files before updating them on the live site, you do not need to push any database tables at all necessarily. Just update plugin and theme files on your staging site by using WordPress internal automatic plugin updater. If all the updates are working well on the staging site, just use the Push Changes button and all plugins and themes are pushed and updated on the live site. On the other hand, plugin and theme settings are stored in the database of WordPress. Also database based operations like creating new posts, assigning new menus, putting widgets to a new place or changing and saving plugin or WordPress related settings are stored in the database. Installing a new plugin is also a database operation. So, if you do not want to recreate all settings on the live site you need to push the database tables, too. Next, click on Select Files and choose all plugin, media & theme folders containing the data you like to move over to the production website. You can also define extra folders you like to move to the live site by adding the full absolute path into the text area. Click on Push to Live Site and the copy process starts. You’ll get a progress screen. which ends after a while. After that just reload your website and you’ll see all the new content on your live site. Note, that WordPress sometimes requires you to log in again after a full push. Delete the file on the live site and the staging site at the same time.